It’s a story we hear often. An artist thinks that if she can just get her music onto iTunes, it will launch her music career to the next level. After all, she reasons, iTunes is the largest digital music retailer out there, with more downloads than anyone else, isn’t it? Listing my music on iTunes is bound to bring me my big break, or at least a surge of sales, right? Wrong. We know that this might fly in the face of everything you’ve heard or believed to be true. Hear us out, and listen to this story. We know an accomplished artist who released a new album a few years ago. He’d spent a year perfecting the lyrics and rehearsing the music; then, he went to a recording studio and worked until the sound was perfect. Next, he had it mastered by professionals, who did a wonderful job putting it all together. He hired professional, experienced designers to create the right “look” for the album. He was willing to put in the hours and effort, take all necessary steps, and spend the money to put out a top-notch product. He was thrilled with the results, and his hopes were high. He hired a company to put his music on iTunes. When the album was available, he told all of his existing fans to go buy it on iTunes. Then he sat back and waited for success. Initially, downloads were strong, and he even moved up the iTunes charts. His fans commented that they loved the release, and everyone he knew seemed to own the album. Soon, though, his sales dropped off. He began to be pretty concerned. After having his new album on iTunes for a year, he compared his sales to the expense of putting together the album. The results were bleak. The increase in exposure that he had expected was not reflected in the sales numbers. Despite the initial surge of sales (which was likely due to his promotion of the album with existing fans), the album had not sold well on iTunes. His profit from the sales on iTunes would not have been enough to recover the cost* of listing the album on iTunes, yet alone the cost of putting the album together. Fortunately, he had not relied solely on iTunes, and he had sold some CDs at gigs. Overall, though, the experience was extremely disappointing. In our friend’s mind, something had gone wrong. iTunes hadn’t exposed him to a large number of new fans who would purchase his album. Instead, it had functioned as an expensive cash register for his existing fan base. Additionally, he had no way of knowing who had bought his music, which meant he had no way to contact them about future releases. 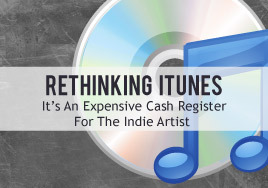 The same is true for most indie artists using iTunes. So what actually went wrong? Nothing. His initial expectations of iTunes were wrong. It is a familiar place to purchase digital music; it’s not a marketing engine. If you’re expecting iTunes to market your music, you’ll probably wind up as disappointed as our friend. If you expect it to be the cash register that it is, you’ll fare a little better. However, there are still issues you should be aware of. After all, you did just pay iTunes a large percentage of your income, and most of your sales probably came from people you sent to iTunes in the first place. On top of that, it is critically important for artists to know who their fans are. This is a much bigger issue than price. These customers are the people who are most likely to purchase your music in the future or attend your gigs. Knowing who your fans are and creating lasting relationships with them is much more important in the long run than a fee you have to pay to sell your products. iTunes agrees that the customer data is important. However, they think they are the primary factor driving your sale, not your music. iTunes claims ownership of the fan relationship, and they will not share all the details with you about who purchases your music. Since iTunes is by far the dominant digital music retailer**, they can get away with this. Should I Even Use iTunes? In light of what we’ve said above, this next part is going to sound crazy. The truth is you need iTunes, but not the way you thought you did. It is true that iTunes will not do much to market your music, but it does recommend similar artists or tracks (thus increasing exposure, albeit minimally) to what buyers have purchased or listened to. Also, millions of people use iTunes to download their digital music selections. If someone gets on iTunes and wants to purchase your music, you want it available for purchase. After all, sales are a good thing. Boycotting iTunes altogether means losing out on sales and exposure. What you shouldn’t do is send people to iTunes to purchase your music. Look into alternative services to sell your music. There are a huge number of them and many do a good job while maintaining a fair and reasonable price. (We’ll provide more on this in future articles.) This can seem to be an overwhelming task, but it doesn’t have to be. Do some research and learn what you can. Only agree to a retail platform if it puts you in control of the sale by telling you who bought from you, what they bought, and how you can communicate with them. As an indie artist, you can’t count on someone else to do the legwork for you or make you famous, especially if that someone eats into your profits and gets between you and your fans. If you want to be successful as a musician, you must work at your music and work at the business side of the music industry as well. Be prepared to sell physical products as well as downloads. Figure out which marketing tools work best for you and use them. Do not overlook social media. Your website should be part of the equation, too, so be sure it’s working for you, not against you. Be sure that your website and social media profiles are more than just a picture and short bio. You want fans to interact and keep coming back. Remember: whatever you do, engage your fans and own that fan relationship. While you are researching, remember this. iTunes is a cash register that charges a very high rate for their services while not sharing critical information with you about the purchase, but they are still necessary as a part of your selling process. A small part for sure if you are an indie artist. Just do not count on them to make you famous, you have to do that yourself. * To be fair, at the time he went through this process, the cost to list music on iTunes was higher than it is today. ** This may be changing. 2013 represents the first year that music download sales on iTunes have decreased from the prior year. We could guess that music streaming has been part of this change, but that’s an entirely different story. Great article. It occurs to me that we artists put a heck of a lot of energy into our careers. We, at least, should be privy to who is buying our tunes. Perhaps in the greed-stained gluttony of the music industry ITunes should consider changing its name to MeTunes. JoeyD, we completely agree that as artists, you should have access to your customers’ or fans’ information. As a professional composer/musician for the last 30 years, I’m definitely not so quick to bash iTunes. I make my living from music, and I can say that over 90% of ALL my digital income (including Pandora, Spotify and the dozens of other streamers and mp3 sellers) comes from iTunes. And let’s not forget iTunes was the first income generating service that finally broke the stranglehold of piracy, where us musicians weren’t paid a dime. Streaming is definitely taking over, but I for one will be sorry to see iTunes go. Thanks for the comment. We completely agree that selling music is a much better option for artists than having their music pirated or streamed. We also acknowledge that iTunes is good at selling music; millions of consumers around the world use it to buy music. And, given our understanding of other music retailers and streaming services, we’re not surprised to hear that iTunes is your primary source of digital income. In our article, we don’t tell artists to boycott iTunes altogether. Instead, we suggest that they use it strategically. Our complaints are that iTunes takes a significant cut of an artist’s profit and withholds customer (fan) information from artists. If you’re sending all your business to iTunes, you’re losing money and fan data… which can hurt you in the long run. On the other hand, if you offered a few songs on iTunes as teasers but sold the majority of your music only on your own website, you would be retaining the entire sale price and obtaining data on your fans. That data means you can market future releases to the people who already like and buy your music, which is preferable to having no one to market it to. Selling it yourself means you can set your own pricing and choose whether or not you want to sell singles. A $10 digital album sale is much better than two $1 singles. We’re genuinely curious: with streaming “taking over”, as you said, how do you see artists making a living? What plans do you have to combat or offset the losses streaming brings?